Whether or not eating eggs is good for your health has been a topic of debate for decades. While some people have worried about the cholesterol they contain, others point to them as a great source of protein. Me? I eat eggs despite my heart history. But we need to remember that dietary cholesterol is only part of the puzzle. Most of the cholesterol floating inside our bloodstream is manufactured by the liver and can be influenced by stress, weight, exercise, genetics and what else you eat in addition to eggs. And over the last few years, the research on eggs has gone back and forth. It’s enough to make your head spin. And now, a new study is calling into question the safety of having your eggs and eating them too, especially when it comes to your heart. Until 2015, eating less than 300 milligrams of dietary cholesterol per day from any sources was the guideline recommended in the U.S. But the most recent dietary guidelines omitted a daily limit when it came to cholesterol and included weekly egg consumption as part of a healthy diet. They looked at pooled data on 29,615 U.S. racially and ethnically diverse adults from six different studies with up to 31 years of follow up. They discovered that adults who ate more eggs and dietary cholesterol had a significantly higher risk of cardiovascular disease and death from any cause. Specifically, the results showed that eating 300 milligrams of dietary cholesterol per day was associated with a 17 percent higher risk of heart disease and an 18 percent higher risk of all-cause deaths. And they were able to isolate the cholesterol as the driving factor of those numbers, completely independent of saturated fat and other dietary fat. 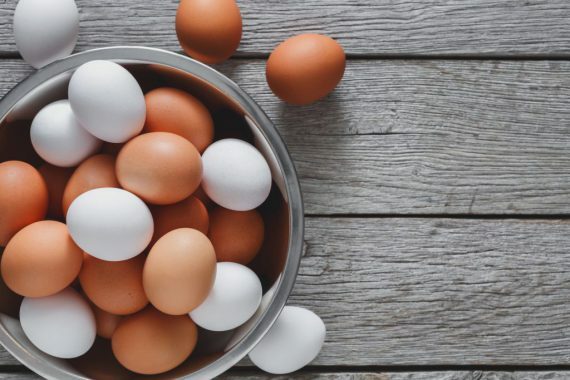 When it came to eggs themselves, the researchers say that eating just three to four eggs per week was associated with 6 percent higher risk of cardiovascular disease and 8 percent higher risk of any cause of death. According to the researchers, the difference was the fact that those studies generally had a less diverse sample, a shorter follow-up time and a limited ability to adjust for other parts of the diet. If dietary cholesterol is a concern, you’ve got to examine all the food sources in your daily diet, including meat and dairy products. Put simply, have your eggs, simply eat them and any other high-cholesterol foods in moderation. It’s important to remember that beside protein eggs contain essential amino acids, iron and choline. The study authors surmise, the key is to stay below that 300 milligrams of cholesterol per day from all the foods you eat combined. Keep in mind that can be difficult if you’re used to starting your day with two to three eggs since just one large egg has 186 milligrams of cholesterol in the yolk. I’ll continue to eat my eggs for their protein and near perfect nutrition and look to cut cholesterol elsewhere — such as avoiding the bacon and burgers. As well as load up on nutritious cholesterol lowering foods such as apples, oranges, grapes and oats to name a few.